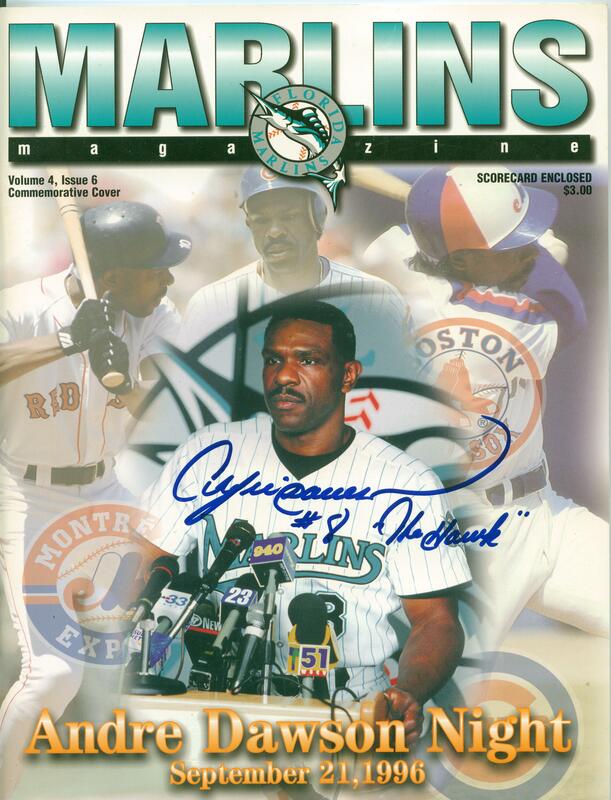 Autographed Andre Dawson Retirement Night Program – SWEET!!!! I cannot believe how easily I was able to grab this one – and super cheap too!! I had been watching this very program, unsigned, on Ebay for a very long time. The seller refused to budge on his price after several back and forth messages. Simply stated, I was unwilling to pay what he was asking and since he was not getting any bids, I tried to ‘reason’ with him. Well, I failed at that task. But, my patience absolutely paid off as I continued to watch for new ones to come along. And after a long couple of months, one did and it was much better than the prior one. Because, my friends, it was autographed by the one and only Andre Dawson!!!! Have a look at the latest, and possibly one of the greatest, additions to my ‘Ultimate Dawson’ collection. This entry was posted in Andre Dawson Collection, Autographs, Chicago Cubs and tagged all-star, Andre Dawson, Andre Dawson Collection, autographed baseball, autographed baseball collection, Autographs, baseball, baseball cards, boston red sox, Chicago Cubs, collection, collector, Cubs, Expos, Florida/Miami Marlins, gold glove, Hall Of Fame, helmet, hobby, HOF, Marlins, mini helmet, montreal expos, most valuable player, MVP, red sox, signed 8×10, signed 8×10 photo, signed helmet, signed photo, signed picture, silver slugger. Bookmark the permalink. most excellent get. patience paid off, brother.